Evander "The Real Deal" Holyfield took boxing lessons as a child at his local Boys & Girls Club. We are thrilled to announce that Boys & Girls Club Alumnus, bronze medal Olympian, and Heavyweight Champion of the World Evander Holyfield will be joining us at A Chair Affair 2018 on Saturday! Guests will have the opportunity to meet The Great One, and Holyfield will deliver a special message during our event. Limited tickets remain, get yours today. Born on October 19, 1962, in Atmore, Alabama, Evander is often referred to as "the Real Deal," Holyfield, the only four-time world heavyweight champion. He grew up in Atlanta, Georgia, and took boxing lessons as a child at the local Boys and Girls club. He competed as an amateur in the Golden Gloves competitions in the early 1980s. After winning a national Golden Gloves Championship in 1984, Holyfield made the U.S. Olympic team where he received the bronze medal. After the Olympics, Holyfield turned professional and won the World Boxing Association's (WBA) World Cruiserweight title in 1986 by defeating the reigning champion Dwight Qawi. Holyfield trained hard to become big enough and strong enough to compete as a heavyweight fighter. In 1990, he became Heavyweight Champion of the World, defeating James "Buster" Douglas, the holder of the WBA, International Boxing Federation (IBF), and World Boxing Council (WBC) championship titles. Holyfield took out Douglas in only seven minutes. Holyfield's intense rivalry with boxer Riddick Bowe began in the early 1990s when he suffered a big defeat to Bowe in 1992, losing his title. It was his first loss in twenty-nine professional fights. After briefly contemplating retirement, Holyfield was back in the ring and anxious to reclaim his title. He did just that when he got his rematch with Bowe in 1993, winning by decision. After overcoming health challenges, Evander Holyfield returned to the ring and eventually fought one of the most notorious boxers in history, Mike Tyson. Holyfield beat Tyson in their first encounter in 1996, winning the WBA championship. Evander Holyfield, attributes much of his success to the support and encouragement he received as a child. As a way to give back to the community Mr. Holyfield created the Holyfield Foundation to help disadvantaged young people become healthy, successful and productive adults. The Holyfield Foundation strives to strengthen the lives of youth and their families by establishing and funding programs dedicated to their athletic, academic and spiritual development. Posted on February 19, 2018 by Naura Anderson. Revitalight Therapy & Skincare is offering a special deal to A Chair Affair attendees! From February 21 – 24, for each Spray Tan service purchased ($40), Sun Place will donate $10 to Boys & Girls Club of Rochester. Visit one of their two Rochester locations, and mention this offer to support Boys & Girls Club of Rochester while getting yourself ready for the big event! Posted on February 1, 2018 by Lori Trotman. Another great tux deal from Mestad's Bridal & Formal Wear! Look as fabulous as these guys with some help from Mestad's Bridal & Formal Wear! 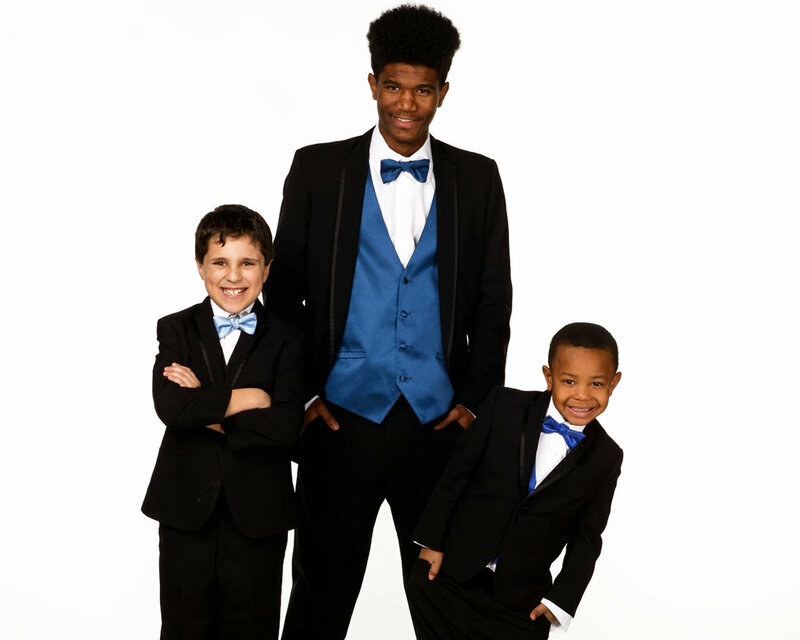 For our A Chair Affair 2018 guests, Mestad's is offering a great deal -- $129 tuxedo rental! Contact Mestad's for more information on how to rent a great tux for A Chair Affair the weekend of February 24th. Posted on January 26, 2018 by Lori Trotman. We are pleased to announce our co-chairs for A Chair Affair 2018: Claudia Tabini & Randy Brock! These talented volunteers are taking a strategic look at ways to make this year's event more successful than ever. Thank you Claudia and Randy for contributing your time and talent to supporting our Club programs! Posted on December 6, 2017 by Naura Anderson. Join Boys & Girls Club of Rochester in supporting Rochester’s youth through artistic generosity! The 16th annual A Chair Affair is Saturday, February 24, 2018. It’s the creativity and caring of our community that has helped this event grow and impact our Club kids for the past 15 years. Now is the time we call upon artists to share their talents with us. • A chair is an artistic creation of a seating apparatus - functional or nonfunctional. • Chairs that are created with unique designs, materials, or concepts are most popular. • We will offer just ten chairs on the Live Auction, and 30 chairs on the Silent Auction. If you would like to create a chair for this event, please contact chairaffairrochester@gmail.com by Friday, August 4, 2017. We would like to identify our 2018 artists this summer; please note, the deadline to submit your chair is December 22, 2017. Check out our galleries of past ACA chairs. For more information and updates, find us on social media. Posted on July 25, 2017 by Naura Anderson. Sun Place Sun & Skin Care is offering a special deal to A Chair Affair attendees! From February 21 – 25, for each Spray Tan service purchased ($40), Sun Place will donate $10 to Boys & Girls Club of Rochester. Posted on January 31, 2017 by Lori Trotman. Enjoy a great tux deal from Mestad's Bridal & Formal Wear! Look as fabulous as these guys with some help from Mestad's Bridal & Formal Wear! For our A Chair Affair 2017 guests, Mestad's is offering a great deal -- $129 tuxedo rental! Contact Mestad's for more information on how to rent a great tux for A Chair Affair the weekend of February 25th.